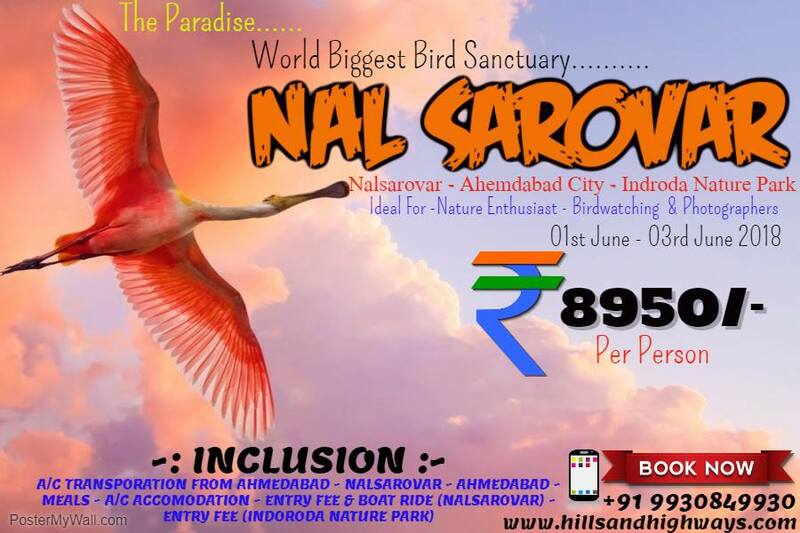 Nal Sarovar Bird Sanctuary:- Nal Sarovar is a bird sanctuary which is spread over an area of 120.82-sq km, which is quiet with shallow water (4-5 feet), which has 36 small islands. Nalsarovar is located at a distance of 60 km near Sanand village of Gujarat, Ahmedabad. Mainly inhabited by migratory birds in their winter season, the wetlands of Nalsarovar are the largest wetland bird sanctuary in Gujarat and the largest bird in India. Nalsarovar was declared as Bird Sanctuary since 1969. Nal Sarovar Lake lies in the lowest area between Central Gujarat and East Saurashtra. It represents the sea link which exists between the Little Rann and the Gulf of Cambay. More than 200 types of birds live mainly in this lake and here the foreign birds of Siberia come. In Gujarat, Nalsarovar is considered a paradise of bird watching, various species of Rosici Pelicans, Flamingo, Cracks, Brahmin Ducks, Purple Lake, Deer, White Storks, Bitrates, Gibbes etc. Indroda Nature Park (INP) is an environment conservation initiative led by the Forest Department of Gandhinagar. Situated in the capital city of Gujarat, this park covers a total geographical area of 428 hectares, which is covered with dense forestation and rich vegetation. River Sabarmati gently meanders through the verdant terrains of this park – dividing it into two sections. Since its establishment in 1970 as a ravine-reclamation area, this nature park has come a long way in becoming a beautiful man-made forest and delightful tourist attraction of the city. The nature park has been divided into various sections, which are dedicated to different varieties of flora and fauna. The Dinosaur and Fossil Section is the most intriguing, which displays bones, eggs and other precious fossils related to this extinct animal. Mammals, reptiles and birds can also be seen in this conservation area. While the Earth Section is related to geology, the Marine Section is all about sea organisms. Indroda Nature Park also has a Plant Section and Botanical Garden, where a large number of indigenous trees, ornamental exotic flora, succulent plants and medicinal herbs are planted and preserved. Indroda Nature Park is an ideal place for nature and wildlife photography as it is home to several animal, avian and plant species. A tour of Indroda Nature Park would acquaint children with different types of vegetation and wildlife. This park also creates awareness among children about environment conservation. Evacuation and any related expenses. And any item not covered under ‘inclusions’. 3. Carry Odomos or any other mosquito repellant. 6. Do not touch any creature or plant without permission. 7. Do not venture out in the forest. 8. Strictly, NO smoking, alcohol consumption or intake of un-prescribed drug will be tolerated. 12. Biscuits or any snack containing glucose. 13. An extra pair of dry clothes if you want to change in evening. 14. Plastic bags for dry items in your bag like clothes, electronics etc. Note:- Booking amount won’t be refunded if the participant does not show on the event day.